Over 100 years ago, Swedish immigrant Alfred Johnson established Johnson Orchards in the beautiful Yakima Valley. Alfred immigrated to America in 1889 and earned his citizenship by working for a short time in Grundy County, Iowa. He then moved to Whidbey Island, Washington and planted an orchard. A train trip into Eastern Washington brought a new opportunity for Alfred and his brothers to establish orchards in Yakima, Valley. In the late 1890's, the railroad was selling irrigated land in Yakima, Washington. The railroad was offering free trips to the Yakima Valley to anyone who wanted to purchase land and plant orchards. 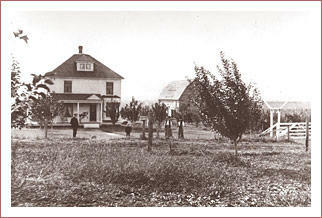 Alfred and his brothers took the trip to Yakima, purchased 60 acres of land, built homes and established Johnson Orchards in 1904. Once the trees started producing, Alfred hauled apples to Seattle where they were packed in barrels with straw and shipped by boat to Sweden. He did this for several years. In 1916, Alfred built the warehouse that still stands today. He was an early member of the Yakima County Horticultural Union, which was a grower-owned fruit packing cooperative now known as Snokist Growers. We continue to be members and still deliver fruit to Snokist. During the 1940's, new subdivisions starting sprouting up on Yakima's west side, bringing more people nearer to the orchard. Alfred's son, Roy, Sr., continued to direct market his fruit here at the warehouse. He also hauled fruit to sell at the Seattle Produce Market on Western Avenue, driving at night so he would arrive by 5 :00 A.M. when the market opened. After serving in World War II, Alfred's grandson, Roy Jr., became a teacher in the Yakima school district. He helped out at the orchard on weekends and during the summer months. When Roy, Sr. died suddenly in 1959, Roy, Jr. quit teaching and came back to run the orchard full time. 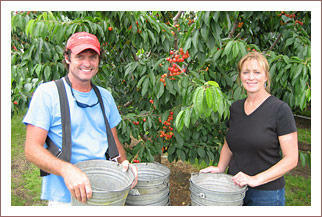 For the next 30 years Roy, Jr. and his wife, Donna, continued to direct market their cherries, pears and apples. 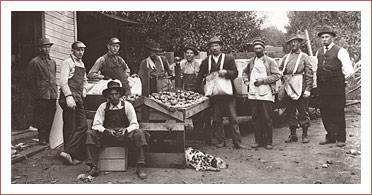 Roy, Jr. advertised fresh Yakima cherries in the Puget Sound area newspapers. Families from west of the Cascades made a tradition of coming to the orchard to purchase fresh cherries. Some of those same families, along with new ones, still make the trip each season. Roy also hauled fresh apples to the Seattle and Tacoma school districts to be used in the school lunch programs. In 1980, Roy and Donna's son, Eric, came back to the farm to help with day to day operations. Today, Eric and his wife, Jill, have diversified the acreage to include most fruit crops grown in central Washington. We have several varieties of cherries, apricots, peaches, nectarines, pears, plums, pluots and apples that we direct market out of the same fruit packing warehouse Alfred built in 1916. In 1998, Eric and Jill partnered with Virgil and Selma Umbarger and developed 40 acres of various tree fruits on Naches Heights. In September 2004 we celebrated our 100th Anniversary with an open house showcasing our fresh fruit, fruit desserts, apple cider and cookbooks. Many past and current customers were on hand for the celebration along with present and former employees. A commercial kitchen was added in 2011. Jill and her daughter, Adrienne Engelhart, bake fresh pies and other sweet treats throughout the season. The kitchen is also home to Copper Pot Caramels, owned by Adrienne and Colleda Monick. We are grateful for the many employees we've had over the years, including members of the Alberto Gutierrez family for more than 35 years of service, and our extended family members. We appreciate the many long time loyal customers. Our employees and customers have helped make the orchard a success through the years. Many changes have occurred since Alfred established the orchards over 100 years ago. The dirt road that the wagons used to haul fruit to the warehouses is now a major 4 lane arterial through west Yakima. Neighboring orchards are gone, replaced with housing developments, condominiums and shopping centers; yet Johnson Orchards remains. An oasis in the city and a place to step back in time. A place to enjoy the bountiful, mouthwatering fresh fruit of the Yakima Valley . We invite you to visit us at Johnson Orchards.